I'll address that big hot sweaty elephant in the room right off the bat -- it has been hotter than hot in the Willamette Valley this week. Corvallis, for instance, experienced a all-time record of 108 on Tuesday. I was out of town yesterday in Central Oregon, but it was so hot that my roommate set up a special fan operation on my wine rack. Not only was that very kind of him, it leads me to the real topic of this post: my wine rack. Featuring 12 cross bars and 12 ends, this 72-bottle rack is made from plantation-grown australian pine and has an attractive mahogany finish. After a somewhat grueling assembly process, it was quite the to joy sort and organize my wine in a more efficient mechanism than wine case boxes sitting on the floor of the dining room. It looks nice, too. While I still haven't given up on my quest to find the "perfect rack," the one graced by my wine right now will hold me over until then. I definitely recommend this product as it is well-received both in function and form. How are you all storing your wine? After Friday's hot and intense ride to Tyee, The Oregon Wine Blog staff made the wise decision to revise Stage 4 of Le Tour de Vino to a more relaxing journey in which others could participate. I know what you are thinking -- those lazy bums -- but we found a treasure in downtown Corvallis that was totally worth the modification. Alyssa, Rick, Megan, and myself headed to the Corvallis Farmers Market and hit up Belle Vallee Cellar's new tasting room located in the Water Street Market building at 1st and Monroe. I have driven by Belle Vallee's winery on Buchanan for a few years and have always been intrigued, so the opening of a new tasting room was the perfect opportunity to check out the winery. Immediately we were struck by the gorgeous tasting room and expansive deck (where they serve appetizers and wine by the glass on the riverfront), and were greeted by Brad, the new Director of Sales & Marketing. Belle Vallee offers a few different flights for tasting; we decided to go for the big red flight. 2002 Merlot: As one of the inaugural vintages, we were lucky to taste this wine and I immediately knew I was coming home with one. It's obvious the years have treated it well, and it was very nicely received by our non-merlot drinking friends. With "opulent black fruit flacors" and a nice finish of blackberries and chocolate, our taste was quite enjoyable despite the heat of the day. 2006 Southern Oregon Red Wine: This Southern Oregon red blend consists of mostly Cab Sauv with Merlot and Cab Franc rounding out the finish. While this is not a wine that I predict will win many awards, what's great about this blend is that it's one of those perfect "utility" wines. It's blended in a fashion that it will go well with a variety of food pairings, is inoffensive to both enophiles and non-enophiles, and can even hold its own by itself. Just enough spice on the nose with a healthy dose of fruit behind it made this one a winner for all of us. As Brad noted, it seems that Belle Vallee is better known in New York than in Corvallis due to the distribution model -- and they are hoping to change that. We look forward to seeing that change as they are putting out some wonderful wine from great fruit. I foresee many a Friday evenings spent on their deck sipping some vino by the river. 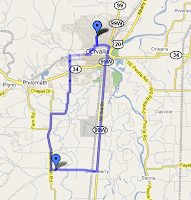 Up next, we have Stage 5 which will take us to Enoteca, also on the Corvallis waterfront. To further celebrate Le Tour de Vino 2009, I recently finished a tabloid-sized poster. The photo was taken by Josh from our trip to Tyee. Prints can be discussed if demand is high enough. For now, enjoy a little design project of mine. Also, expect a full Stage 4 review as well as an updated tour schedule later tonight. After today's stage 3 ride for the Tour de Vino, I can confidently proclaim three things: we chose the hottest day of the summer for this ride, this was the first stage we have completed successfully, and we look good in spandex! Oh yea, today yielded some great wine as well. 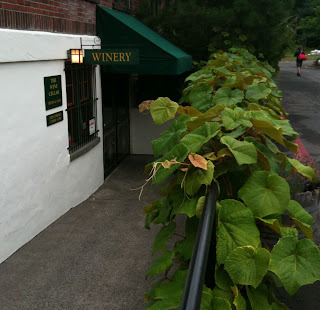 Today's stage took us on a 25 mile roundtrip ride to Tyee Wine Cellars, located between Corvallis and Monroe, Oregon. Specializing in "well balanced food wines", Tyee was the first winery in the Willamette Valley that I visited a number of years ago. I've enjoyed their wine ever since. 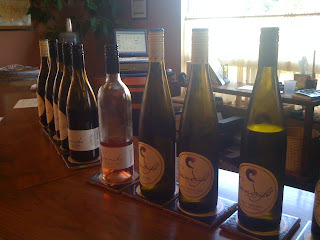 One of the unique things about Tyee is that they produce only estate wines, with three whites and two pinot noirs. Our experience today placed Tyee in the rare category of wineries that in our opinion don't make a single bad wine. We tried 5, but we'll focus on two. 2007 Estate Pinot Gris: The Gris was the first wine we tasted, and given that we were sweating like you wouldn't believe it was incredibly refreshing! With a temperature of 96 degrees, we needed refreshing. With apple, pear, citrus, and floral notes, I look forward to popping open a bottle with some seafood in the coming weeks. 2007 Estate Gewürztraminer: What good timing! We in no way planned this ahead of time, but today was the debut of their 2007 Estate Gewürztraminer. Another internet debut? Either way, Tyee's Gewürztraminer was another hit with both of us. This one was very dry, very crisp, and once again very refreshing. It also had a healthy amount of spice, which dissipates almost as quickly as your palate has the opportunity to enjoy it. Yet another perfect wine for a ridiculously hot day of cycling. We took the scenic route back and even though we ended up on a gravel road for longer than desired, it was a great end to a rough week. As a result of the grueling ride and some scheduling challenges, we are modifying stage 4 tomorrow -- look for a review of Belle Valle in Corvallis. If you are in Benton County, though, stop by Tyee and Jennifer will give you a great tasting! Shortly after introducing myself on my very first post, I received an abundance of welcomes from people all over the Pacific Northwest. I thank all of you and am looking forward to meeting some of you on future wine journeys. Along with one welcoming came a very special surprise. Christine Collier (the new Social Marketer for Willamette Valley Vineyards) not only sent a warm welcome, but also a very special gift and a unique opportunity. Christine sent along two bottles of WVV's 2008 Pinot Gris; a wine that won't debut until their Wine Country Cruise on July 19th. 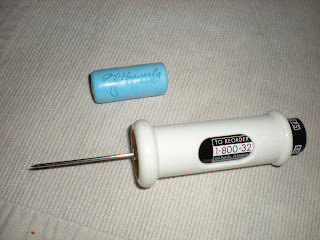 For the first time in Oregon Wine Blog history, I present you a world premier review. Joining me on this tasting and giving his thoughts will be our very own Josh Gana. About: After a cooler than average growing season, WVV' claims that "as this vintage ages in bottle [they] expect it to be the best vintage of the decade." Also noteworthy is because the crop yields were "historically sparse," production of this vintage is much lower than usual. In short, WVV is very proud of this year's vintage and I hope to share the excitement. Josh: Kind of tart/appley nose. A little bit of grapefruit also. A nice, very light color. Nice translucent color. Again very crisp off the bat and finishes with a very strong green apple taste, but doesn't linger. Great wine for a summer day out on the deck chilled. Also would be amazing with seafood; white fish, crab, or of course, salmon. Can't wait to try it at next year's Mo's Crab and Chowder festival. Rick: I completely agree with Josh in regards to the smell and its opaqueness. I also taste the green apple and am almost bombarded with it at first, but the entire experience quickly shifts to more sour citrus hues. Probably my biggest aversions to white wines are those that either linger on the palate too long or those that take one flavor and hammer your taste buds with it to the extent you get bored. This pinot gris does neither and is incredibly refreshing. While Willamette Valley Vineyards is known for their Pinot Noir, they also consistently hit a homerun with the Pinot Gris -- and this vintage is no exception. The 2007 vintage rated 90 and a Best Buy with Wine Enthusiast, and we'd expect the 2008 to meet or exceed that standard. At the $15 - 20 range, this is a must to have sitting on your rack. Here at The Oregon Wine Blog, we've been in love with this gris (and the vineyard) for a number of years...you can read reviews of both the 2007 and 2006 vintages on the blog. If you are in the Salem area on the 19th, stop by the winery and grab a bottle! Thanks again to Christine for such a generous gift. Here's to hoping this review is only the first in a series of world-premier reviews from The Oregon Wine Blog. After a grueling Stage 1 of the Tour de Vino, Stage 2 was planned as a much needed rest day. Just as the elite cyclists participating in the Tour de France are doing today, The Oregon Wine Blog Staff decided to take it easy and spend the day at McMenamins' Edgefield Winery. Aside from having a large assortment of wines from the Pacific Northwest, it is also noteworthy that they host a summer concert series. We just so happened to have tickets to see Steve Miller Band. I had never had the opportunity to visit Edgefield before, but had heard great things. In a nut shell, Edgefield hosts a winery, brewery, distillery, multiple bars and restaurants, a golf course, day spa, concert venue, and a hotel. I'm probably leaving something out, but the point is that it is a very large estate with plenty to keep you busy for a day. 2005 Blanc de Noir, Brut: I'll have to award this wine as the most surprising of the day. This dry, champagne-style sparkling wine is the result of using pinot noir grapes. I normally don't give much thought to sparkling wines, but this proved to me that there is a lot more potential for uniqueness in this category than I originally thought. While dry, it proved a much richer, deeper fruit content than your average champagne. Very well done. 2007 Cuveé De L'Abri Rouge: A relatively traditional Rhone blend, the Cuvee has been a favorite of wine blog staffer Drew Desilet since his first taste a few years ago. While I don't remember the specifics on the blend, the lions share is grenache balanced out by syrah and viognier. Sourced from Del Rio Vineyards in Southern Oregon, this wine is a softer blend that pairs well with lighter red meats or saucier white meats. 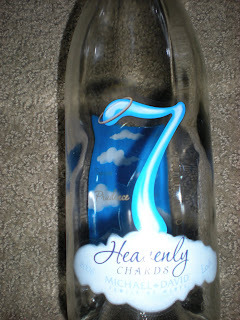 This is one of those bottles that is nice to have sitting around to drink because you are thirsty. In short, the rest are solid wines that are in all intensive purposes good, but not great. They appeal to a very broad range of people and are absolutely perfect if you're catering to both enophiles and non-enophiles alike. This is certainly not a bad thing at all and I think McMenamins' success with wine stems from this very fact. We even have a couple of bottles on the rack ourselves. The most notable wine we had that fits this description is their 2007 cabernet sauvignon. As for Steve Miller Band, we elected to cut the night short due to torrential downpours and a lack of appropriate rain gear. We may be two stages in and yet to complete a full stage yet, but there's still plenty of hope. We're definitely looking forward to Stages 3 and 4, so stay tuned for more excitement from the 2009 Tour de Vino. As a result of the aforementioned facts, Horizon Air is by far my favorite airline. Not only do they have a robust regional route map, good fares, and convenient schedules, but their customer service is excellent. I digress. Much more relevant to this blog is the fact that on every flight, for passengers 21 and over, Horizon features complimentary northwest microbrew and wine on a monthly rotation. With most airlines cutting back in this day and age, catering to the tastes of enophiles such as myself is a rarity and much appreciated. Yesterday I was traveling from Eugene to Pasco, via Seattle, and was happy to take some wine off of their hands. On this flight the option was a Chardonnay from Sawtooth Winery. Located in Nampa, Idaho, Sawtooth is an emerging contender in the Northwest wine market. I'll leave the detailed review of this wine to others, my point really is....free! Support a local company, drink some free wine, and choose Horizon next time you are flying in the northwest. Does the perfect wine make the perfect night, or vice versa? It's kind of like debating about whether the chicken or the egg came first -- there is no clear answer and really, does it matter? I'd argue that an amazing wine can create an experience, and an excellent experience can enhance a wine. A few weeks ago I had an opportunity to have one of those pretty much perfect evenings and it involved the 2005 Col Solare Red Wine. The nexus of great company, delicious food, celebrative circumstances, and mind-blowing vino left me in a near transcendental state and definitely begging for more of the Col Solare. May had been a very long month with a lot going on for both Rick and I, and I was on the eve of embarking on a business trip to England while in the midst of a battle with the cable company. Talk about frustration... Knowing that I was going to be engaging in my last minute packing routine, Rick offered to make dinner as somewhat of a celebration of a number of factors. I quickly took him up on the offer. He walked through the door after a longer than usual trip to the store mumbling something about a special ingredient that was harder to find, and next thing I knew I was staring straight into the eyes of one of the most delicious bottles of wine I have experienced -- the Col Solare. We had been talking about the Col Solare for quite a while having read reviews, but here at The Oregon Wine Blog we are of modest means making a $75.00 bottle of wine is a very rare treat. With a blend of 71% Cabernet Sauvignon, 25% Merlot, and 4% Cabernet Franc, this vintage hit both of our wine sweet spots bulls eye. A unique venture from all accounts, Col Solare is a collaboration between Washington's Chateau Ste. Michelle and Italy's famed winemaker, Marchese Piero Antinori. With a winery on Red Mountain that only puts out one wine per year, they achieve their mission of joining the Washington new world with the Tuscan old world style. Constantly rated above 90 in both Wine Spectator and Wine Advocate, the 05 scored 93 and 94 respectively. Immediately we noticed a deep, dark, gorgeous red coating the glass. Upon sniffing, we found the nose on this wine to be rather mellow and subtle. Winery notes list aromas of black cherry, berry, and dark chocolate fused with smooth notes of vanilla and spices. Despite decanting, we really didn't pick up much and had we just smelled the wine and not tasted it, I would have walked away feeling like I got socks for Christmas. Luckily, the delicious nectar quickly made it's way to my mouth where I can only describe the taste as amazing. There was a lingering taste, with a very balanced feel on the palate. The blend was so smooth it felt like silk. Tasting notes indicate long, lingering flavors of cocoa, black fruit, and vanilla. Bottom line, if you get a chance to experience Col Solare - do it. They are on my list to visit next time I am in the Red Mountain area, and when I have some extra cash laying around another bottle will probably end up on my rack. Leave a comment and let us know what your favorite northwest wine is and the experience that made it great for you! We are working on a new look for the blog! What do you think so far? It's no secret that we at The Oregon Wine Blog love wine, but a littler known fact is that some of us are big fans of cycling as well. To both celebrate the 2009 Tour de France as well as the beautiful scenery of the Willamette Valley, we're starting our own (mostly) cycling tour. 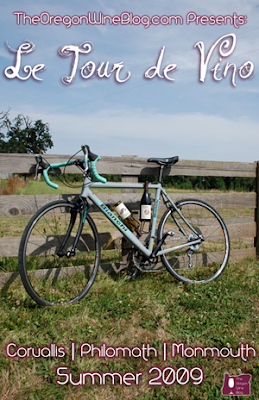 Let me introduce you to our very first cycling event; the 2009 Tour de Vino. 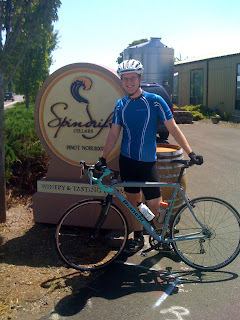 Spindrift Cellars is a small, family-owned winery located in downtown Philomath. We made this ride a little longer than the typical straight shot from Corvallis to enjoy the beautiful scenery via back roads. We ended up arriving exactly as Spindrift was opening and were delightfully surprised by a rather beautiful tasting room. Neither Josh nor I had tasted many wines from Spindrift before, so we elected to do a full tasting of both their reds and whites. Of the ten total wines we tasted (don't worry, we split each tasting), a few specifically stood out to us. 2007 Pinot Gris - This wine is rated a 90 and a best buy from Wine Enthusiast magazine. Needless to say, this wine was the perfect way to begin a wine tasting after cycling in 90F+ weather. What won me over with this wine were its strong hues in the realm of more citrus fruit than some other pinot gris. This also won Josh over indicated by his purchase of a bottle. Spinnaker 2007 Pinot Noir - What's interesting about this pinot are a few things: Spinnaker is Spindrift's restaurant wine label, the wines aren't certified sustainable or salmon safe (as are the rest of Spindrift's wines), and the initial feeling is that these wines may not be replicable. Long story short, something went very right in the fermentation process and an 88 score from Wine Enthusiast was awarded. Spinnaker's 2007 pinot noir is lighter on fruit than some other pinots, but still manages to convey bold flavors of darker fruit. At only $18 a bottle, this is a steal. 2007 Syrah - We like big reds and it is always a pleasant surprise to find a Willamette Valley winery putting one out on the street. The 2007 Syrah has some spicy oak and black pepper, and was a nice end to our tasting flight. Produced with fruit from Seven Hills Vineyard from the Walla Walla AVA, this new release provides a solid anchor point on the red end of the spectrum. With a relatively small production, better grab some soon. With tasting out of the way, it was time to ride back home. At approximately .25 miles away from Spindrift, our very first mechanical issue of the tour reared its ugly head. As we rode through our first green light in town, I somehow ended up popping my back tire. This was no ordinary flat as instead of a normal puncture like most flats, a large section of the sidewall of my tire completely blew out. This is where our stage ended and we had to wait for our team car to come pick us up. Even with our stage ending sooner than we thought, Stage 1 was still a really fun ride and a great day tasting wine. Our last Gathering Together Farms dinner was over a month ago, but we still have one last food pairing to write about. Before I write about our dessert experience, let me preface something. I do not like dessert wine. I'm putting this out there to be completely honest. I typically don't enjoy wines with high residual sugar and will almost always pass up dessert wines at tasting events. Now that that's out of the way, let's get started. Our dessert of the evening was a Strawberry & Rhubarb Japonaise. This was the absolute perfect way to top off our phenomenal meal. While sweet, it was also light enough to be somewhat refreshing. This lead me to believe our wine pairing was most likely going to dominate in the sweet department. Paired with our dessert was a pouring of 2005 Harris Bridge Vineyard Sedouce; a pinot noir dessert wine out of Philomath. From the winery: Luscious, sweet and intense. Dark cherry, hints rose petal in the aroma. Raspberry coulis on the palate and a heady warmth carries the finish. As somewhat of a wine novice, I'll admit I was intrigued by a pinot noir dessert wine. I had never had one before, but I was scared at the fact this wine sits around 10% residual sugar. I'm glad I kept an open mind because this wine was incredible. I didn't take tasting notes at the time and would otherwise apologize for not being able to be specific, but lucky for you we just so happened to buy a bottle at the end of the night! As a side note, what's somewhat unique about wines from Harris Bridge is that they wrap each bottle with short stories written by its owners. This wine pours a translucent, dark rose color and gives off very strong hues of dark cherries, raspberries, and lots of sugar. Interestingly enough, it also gives off the impression that it has a higher alcohol content than it really does. Harris Bridge's description of Sedouce is dead on and I really don't have much to add other than I am incredibly impressed. This is the first dessert wine I've had that's not just delicious, but very memorable as well. Sedouce is available for $29. As final pleasant surprise, we were offered a super secret pour of Chateau Bozo's pinot noir.